Wellness Programs- A Private Practice Cash WinFall? Obviously that was a joke. They spent a whole 30 seconds creating that page. Private Practices like to say they are “wellness centers”, but just like the government they spent a whole 30 seconds thinking of the name. Let me show why this is different concept to approaching wellness. During the interview, my mind was racing with great marketing ideas for my practices. How could I use Brad’s courses to help my practices explode with our newly added wellness programs? Have you tried to service the corporations in your area? But have been stuck with a breakthrough. We reveal a “golden nugget” early in the episode. Dont miss it. Brad Cooper is a rare breed of entrepreneur. He has so many plates spinning I had to ask about his time management skills. He went on to give me step by step time management tactics to use immediately. Here is how can you create a time management protocol that fits for your practice and your life. We dive in deep about all the tools we have used to widen our thinking as entrepreneurs. There are so many books and courses, that i couldn’t list them all. One such recommendation was how Seth Godin can change your thinking. His daily emails are more than inspirational states Brad. His intuitive look at the world makes you rethink your business and your life. Here at the Private Practice Business Academy, I have introduced the how. The how to build up a network with physical therapists and internal medicine providers. The opportunities that are available. This is the kind of thinking I have done with many providers. From a closed door event to phone calls. 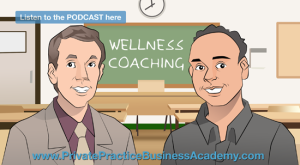 Take a listen to this entire interview and see if you can get any ideas on how brad can help you develop a wellness coaching program for your practice.